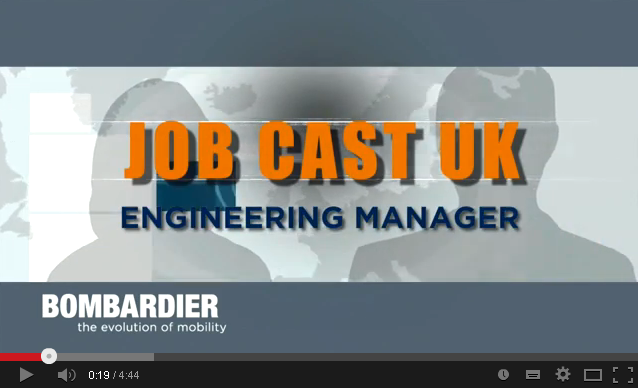 Bombardier Rail Jobcasting makes a lot of sense because where a job description communicates the opportunity, video and audio can help establish the sense of "fit" that is so important for a job seeker. Bombardier Rail improves its communication and recruitment process. According to the most relevant newspapers and e-journals, more one billion people in the world are watching online videos every day. Another recent study showed 56% of people are watching online videos at least once a month on their mobile devices. With the amount and portability of online video, recruiters have begun to look at the benefits of this technology. Jobcasting makes a lot of sense because where a job description communicates the opportunity, video and audio can help establish the sense of “fit” that is so important for a job seeker. Thus, recruiters should take advantage of this growth in online video to shorten the hiring process and find great people. Through the following video, the international and affirmed railway company Bombardier Rail proves to perfectly understand these concepts and to be absolutely abreast with the times. Increasing efficiency and attracting better candidates through engaging video and social media experiences are good reasons for HR managers to go high tech or go home.